This year, during our family’s summer holiday, I’m enjoying the hospitality of Prince Edward Island, Canada (hence, the lack of recent posts on QRPer). This is our family’s second visit to the maritime island, and each time we’ve been fortunate to stay at the same off-the-grid cabin on the eastern coast, less than twenty meters from the water. Of course, staying in an off-grid cabin comes with its radio challenges—namely, supplying power—but also comes with one supreme advantage: no noise from the typical electrical devices that plague most of our homes. What’s more, this cabin sits on 60 acres, so not even a neighbor’s home appliances disturb my RX ears. On our previous visit, I brought my (then) Yaesu FT-817, a 9aH gel cell, Micro M+ charge controller, 10W Solarex PV panel, some 300 ohm window line, loads of 22 AWG wire and an LDG ATU. Unfortunately, I found I had very little time for radio, and propagation was dismal. Indeed, it was during that trip that I discovered my FT-817’s finals had blown, so part of the time I was transmitting less than QRPpppp levels. This year, since I knew the site well, I came better prepared. My radio toolbox with various connectors, crimpers, cutters, wires, caps, multi-tester, etc. So…how’s it all working out? Brilliantly! In the past few years I’ve done a lot of QRP CW—mainly rag-chews with some buddies on the lower bands. I’ve done less QRP SSB phone. When I first arrived at the cabin and began the process of unpacking, I couldn’t find the jumper cable to attach to my Vibroplex single-lever paddle (the paddle being a Dayton 2012 find, by the way). So, I plugged in a microphone and tuned to the phone portion of the 17 meter band. 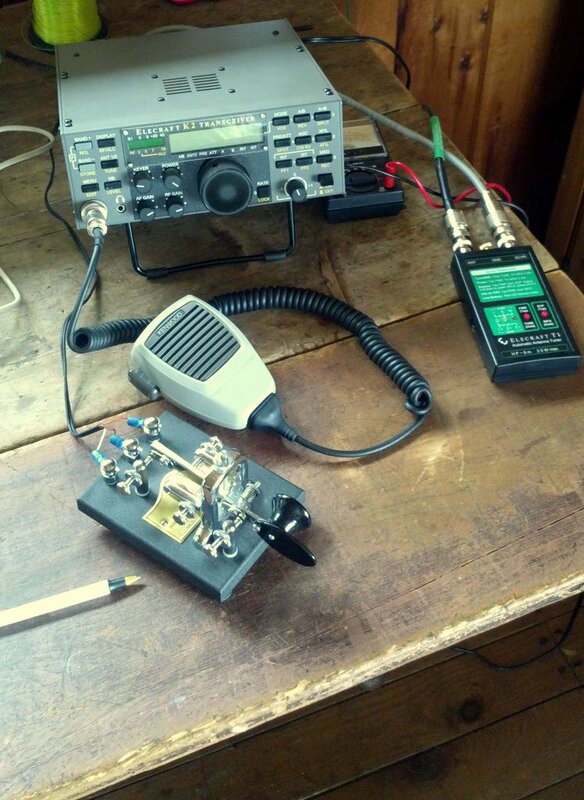 I’ve once again re-discovered the joy of operating QRP SSB. It’s challenging to make those DX contacts and to transmit a long call sign (“VY2 portable K4SWL”) across the ether, but occasionally the propagation gods smile upon you, and you’re able to participate in a good rag-chew or quick DX with a 57 to 59 signal report. Being 20 meters from the salt water is a bonus I don’t usually enjoy in my US hermitage. Due to its excellent propagation characteristics, despite my lower power set-up, I have easily worked stations from Russia to North Africa, from the Caribbean to Japan. I am thoroughly reveling in it, and the process has re-connected me with my ham radio roots. So true, Gunter. That’s what I love about ham radio in general– the hobby is so broad, you constantly discover and re-discover favorite elements about it. This entry was posted in Articles, Portable, QRP, QRPers and tagged Ham Radio, Off-Grid QRP, Prince Edward Island, PV, QRP, QRP Battery Powered, QRP vacation, VY2. Bookmark the permalink.